costs to the grower and consumers. For example, in the case of soil fumigation, although effective disease control may be achieved, such a practice results in major ecological disturbances to the production system as a whole. In the instance of certain chemicals such as methyl bromide, a fumi-gant once widely used for the control of soil-borne plant pathogens, disease control activities not only directly impact the treated biological system but can also adversely impact air quality and may contribute broadly to environmental degradation. Disease management strategies that are considered to impart a more ecologically sustainable footprint, such as host resistance or the application of microbial biological control agents, are generally effective towards a more limited and targeted pathogen population than chemical control alternatives (Table 11.1). With few exceptions, biological controls have not attained the level of performance in terms of both efficacy and consistency required to achieve widespread adoption for use in commercial field-level agricultural production systems. Host resistance is a proven and effective strategy for the management of numerous economically important foliar plant diseases such as those incited by biotrophic rust fungi (Mcintosh et al., 1995). Fewer examples exist for soilborne pathogens or parasites, however effective host resistance has been obtained for the control of particular agents such as the ubiquitous and specialized fungus Fusarium oxysporum (El Mohtar et al., 2007; Herman and Perl-Treves, 2007). Likewise, a multitude of resistance sources in cereals to the cereal cyst nematode have been documented with resistance conferred by a single host gene (Nicol and Rivoal, 2008). Climate change will be likely to have significant impacts on both of these disease control options, which may further limit their potential for the management of soil-borne plant diseases. A dominant impediment to the broad-scale effective use of microbial biological control agents is their failure to persist at required threshold populations in non-native or environmentally extreme environments. Thus, several micro-bial groups currently viewed as an effective source of biological control agents (e.g. Pseudomonas spp.) 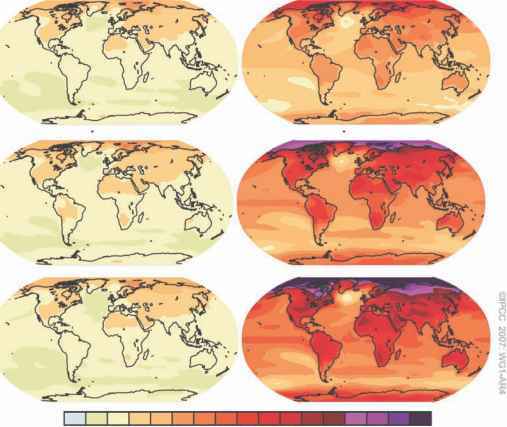 may exhibit impaired performance under the predicted climate change models. Likewise, temperature and drought stress associated with climate change has the potential to modulate the effectiveness of host gene resistance, and not necessarily in a predictable fashion (Garrett et al., 2006). Specific plant genotype Larkin et al. (1993), Mazzola and Gu (2002), Mazzola et al. some instances this will yield changes in distribution or incidence of specific plant pests, with parasites of previously restricted distribution perhaps becoming more cosmopolitan. Nevertheless, within the context of this biological community many elements exist that function to enhance plant growth, development and survival. These include such entities as natural enemies, many of which have been effectively utilized in pest management systems for the biological control of plant parasitic insects. The utilization of natural enemies often relies upon the inundative release of one or a few native or non-native predators or parasitoids, a model commonly employed in the application of microbial biological control (Myers et al., 1989). Within the entomological discipline, an alternative model has been utilized at times to promote native biological control. Such a strategy relies upon the establishment of systems designed to enhance the abundance and diversity of naturally occurring insect predators, ranging from insectivorous birds to the more commonly considered insect predators. Such systems may involve the establishment of mixed cropping systems, internal or external refugia which provide habitats for beneficial organisms to enable pesticide avoidance, an alternative food source or appropriate habitat needs external to the crop production season (Bianchi et al., 2006). Within the context of soilborne plant disease management, attempts to employ microbial biological control have typically involved the inundative release of non-native microorganisms into soil systems. Such an approach assumes that the introduced microbial agent or mixture will effectively compete with the resident microbial community, efficiently colonize the rhizo-sphere of the targeted plant and persist in the rhizosphere at the threshold population required for activity during the period of plant susceptibility, and also that the active mechanism is operative in the environment into which it has been applied. Soil dwelling microbial antagonists of plant pests and pathogens have been studied extensively as to their role in the development of soil suppressiveness (Weller et al., 2002). These same entities have served as a primary source of microorganisms that have subsequently been evaluated for their capacity to function as agents for the biological control of soilborne plant diseases. Despite the extensive study of these microbial biocon-trol agents, there continue to exist extensive gaps in our knowledge of the factors that influence microbial survival and the attributes of the system that will modulate expression of mechanisms directly contributing to disease suppression. As such, in general, attempts to utilize biological control for the suppression of soilborne plant diseases in commercial field-level production systems have failed to yield the predicted disease control potential of these microbial resources. Perhaps this outcome should have been expected as the persistence and activity of any organism in an alien environment, while in competition with the myriad of organisms adapted to that same soil, is rather improbable. In addition, the functional biotic milieu responsible for disease suppression may involve a complexity of interactions well beyond a single microbe or microbial mixture, and may not necessarily function outside its native abiotic matrix.